Noam Galai/GettyTinder cofounder Sean Rad. Tinder’s cofounders and executives are suing parent company IAC and Match Group over allegations that the parent company cooked the books to create a lower valuation for the popular dating app. IAC and Match allegedly inflated Tinder’s expenses and downplayed new features in an effort to create a “false picture” of Tinder’s finances. This led to a private valuation of $US3 billion in 2017, according to the lawsuit. The end goal was to save the parent company billions of dollars when employees cashed-in their equity, by maintaining an inaccurately low valuation for the dating app, the lawsuit claims. 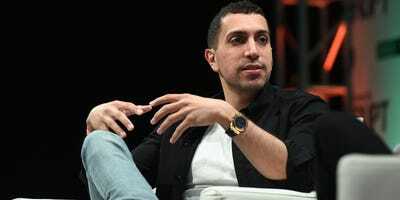 Tinder’s parent company allegedly faked the popular dating app’s financial figures in a scheme to avoid having to pay the app’s founders and long-time employees billions of dollars in equity, according to a bombshell lawsuit filed in New York on Tuesday. The lawsuit, filed by a group of Tinder founders and executives, alleges that the app’s parent company IAC and its subsidary Match Group created a “disinformation campaign” and a “false picture” of Tinder’s financial figures and projections in order to reach a lower valuation for the company. The key allegations in the complaint are that IAC inflated Tinder’s expenses, “inventing an alternative universe in which Tinder was stagnating toward freefall.” IAC also allegedly downplayed upcoming features which would impact Tinder’s performance figures. As the result, Tinder was valued at $US3 billion in 2017 when its growth could have valued it even higher, according to the lawsuit. Like many companies in Silicon Valley, Tinder offered employees and founders stock options to give them “skin in the game,” according to the lawsuit, and Tinder plaintiffs owned more than 20% of the company’s value. But as a subsidiary of IAC, Tinder’s financial figures were private and its valuation was set outside of the public eye. This gave IAC the opportunity to “undermine Tinder’s valuation” to “save themselves billions dollars,” according to the complaint. After the $US3 billion valuation was set, IAC cancelled three scheduled independent valuations set for 2018, 2020, and 2021, and reorganized Tinder’s executive structure so that its early employees could not exercise their stock options at a higher valuation, according to the complaint. Founding CEO Sean Rad was replaced by IAC insider and Match.com CEO Greg Blatt.